The latest reminder of the unfairness of life comes from the good folks at GOOD magazine and graphics partner DeepLocal. In a handy chart, they show just how stuffed the fossil fuel industry has gotten on government tax breaks and cash handouts, while the much smaller share of federal backing that goes to renewable energy has been the target of congressional investigations. 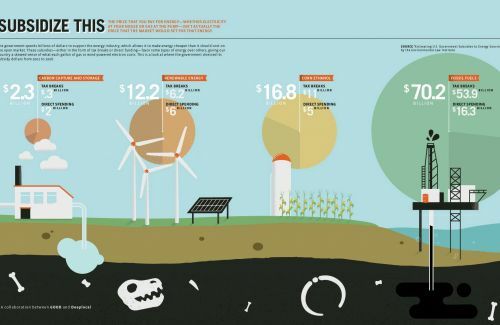 Between 2002 and 2008, renewable energy garnered $12.2 billion in government support, with $6 billion in direct spending and $6.2 billion in tax breaks, according to data from the Environmental Law Institute. 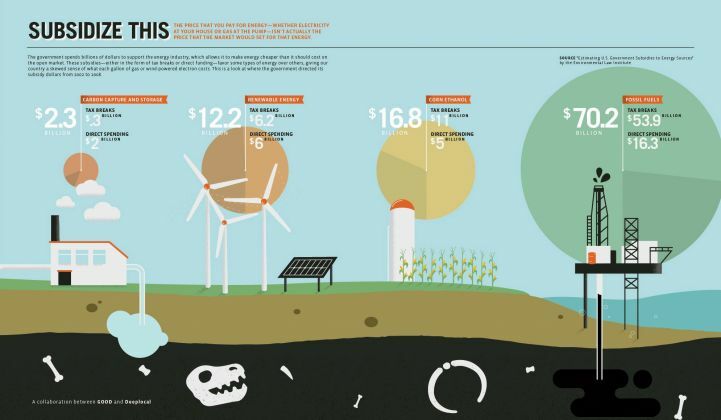 Fossil fuels raked in $70.2 billion in the same time, $16.3 billion directly and $53.9 billion in tax breaks -- all while oil companies have been recording massive record profits. Meanwhile, corn ethanol, a fuel that survives on federal subsidies, brought in $11 billion in tax breaks and $5 billion in direct spending between 2002 and 2008. That, in turn, has made it possible for the United States to turn fossil fuels (diesel for trucks and tractors, natural gas for fertilizer, etc.) into plants, and then turn those plants back into a mandated and price-supported fossil fuel substitute, at a significant reduction in net energy and at great environmental cost. Add this chart to the growing mass of evidence of a mismatch between government largesse and energy priorities. Over the past 15 years, federal support for the oil and gas industry has been five times that for renewables, while the stalled-out nuclear industry got ten times as much, according to DBL Investors Managing Partner Nancy Pfund. Her firm joined Ben Healey, a graduate student at Yale University School of Management and School of Forestry and Environmental Studies, to write a report (PDF) that found average annual support for the oil and gas industry has been $4.86 billion from 1918 to 2009, compared to $3.5 billion for nuclear from 1947 to 1999 and $0.37 billion for renewable energy between 1994 and 2009. It would seem like wind and solar power’s increasing rush toward grid parity would make them targets for more spending, not less. But the Department of Energy’s support for green power is now under attack, with House Republicans leading investigations into the bankruptcy of Solyndra and Abound Solar, as well as the ongoing struggles of stimulus-backed green companies like A123 Systems, Fisker Automotive or ECOtality. In a footnote, carbon capture -- an absolutely essential technology if we’re to keep the grid running on coal-fired power while avoiding global warming catastrophe -- took in $2 billion in government subsidies from 2002 to 2008, according to GOOD’s data. With private CCS efforts on the rocks, more government support will likely be critical for getting the technology into the field. In the meantime, oil and gas and coal keep their engines humming with a generous infusion of government cash. What would the cost of coal-fired grid power be without those subsidies, one wonders -- and that’s not even counting the environmental and global warming costs. Seems like someone in Congress ought to be doing that math.